Andrew Sullivan and Eric Posner are Dangerous Fools: Numbers and Iraq redux edition. This is, of course, the blog-equivalent of the dog-bites-man story, except that this time his ignorance of matters quantitative does not merely encompass the manipulation of numerical objects, but their rhetoric, the use and abuse of selected quantities to minimize the perception of human suffering. The occasion for this arrant blindness comes from a blog entry on the University of Chicago Law School faculty blog by Eric Posner, in which Posner argues that the Iraq invasion was a humanitarian and human rights success. The arguments for human rights advances is based on a number of criteria — freedom of the press, democratic behavior and so on, and I’m not going to quarrel there. But the claim that the American led invasion has reduced the violence, murder and injury suffered by the people of Iraq over that imposed by Saddam Hussein’s regime is marked by such sleight of hand as to be both (a) deceiving and (b) strongly suggestive of bad faith. In short: if we never invaded, Iraqi civilian deaths due to sanctions may well have been greater than the wartime deaths. Andrew’s culpability here is simply that he used his bully pulpit — by some measures the most bulliest in the blogosphere — to promote an argument that turns on a critical weaseling of the data to preserve that very point. Posner’s commenters on the original post do a very good job of dissecting the numerous, elementary errors in his use of mortality statistics; its the very simple mindedness of Posner’s gaming of the numbers that make me see this as pure propaganda, rather than mere stupidity. But those critics focus on errors of method, mostly, Posner’s habit of picking useful baselines, his comparing of incomparables and so on. I just want to bring one more fault up, one that I believe even a completely numerically challenged Andrew Sullivan should have been able to pick up. There is a great deal that is wrong with this passage. The assumption of a continued sanctions regime for a decade is highly questionable, given that one of the stated pretexts for war in the beginning was that the sanctions path was unlikely to hold indefinitely — in part for exactly the same humanitarian concerns that Posner professes here. But while that error is real, and is of a piece with much else in the post that most charitably can be deemed sloppy thinking (again — check out the comments, the glaring lie-by-citation comes in the 100,000 number. Posner is right: there is a reputable project — Iraq Body Count — that states that as of this writing between 89,369 and 97, 568 civilian deaths by violence have been documented since the war began. Problem number one is that IBC itself acknowledges that its belt-and-suspenders approach to documenting a death, necessary to preserve its credibility as the arbiter of the floor, or minimum number of deaths evoked by the war, produces a substantial undercount. In 2006, an IBC presentation stated that the total deaths could be as much as double their published number. That same presentation then took up the then-controversial Lancet/Johns Hopkins study that suggested that between 300,000 and 900,000 civilian deaths had occurred by 2006 as a result of the war, charging that a number of methodological flaws marred the results. The arguments are off point, as the underlying claim in the study is that it is measuring excess deaths rather than deaths by violence. The distinction is crucial, as Posner’s claim, echoed by Sullivan, is that the number of Iraqi deaths due to the war is less than those from all causes due to the direct or indirect consequences of Saddam Hussein’s continued rule and the continuation of sanctions. If you want to compare violent deaths — those the IBC counts — with violence imposed by Saddam’s regime, that’s an apples to apples pairing. If you want to count all the suffering of children lacking food or medicine due to the sanctions regime and Saddam’s manipulation of the UN Oil for Food fiasco, then the proper comparison is to all the suffering induced by the social disruption, the lack of services, the failure of governance that flowed in the wake of the invasion — those the Lancet study and others sought to estimate. Those numbers are huge. They range from over 300,000 (as of 2007) to over a million. Most of the estimates run well above Posner’s highly suspect extrapolation of 400,000 deaths. Both totals are grotesque, of course. It is better to preside over the slaughter of 400,000 than a million only in the most curdled of calculations of moral responsibility. Iraq before and after 2003 offers ample scope for pondering how the international approach to that country and its governance for decades has failed its people. But it is simply wrong — and dangerous, and morally bankrupt — to defend the invasion of Iraq on the grounds that it saved lives. No reasonable assessment of the data on hand support that claim, and its making serves to grease the skids for the next, ever hopeful essay in defense of American exceptionalism and the uses of violence for good. I don’t know much about Posner. He has the fact of a famous father behind him, but this does not mean that he is merely a self-made son in the manner of such luminaries as Kristol, W. or Goldberg, J. At the same time, the real accomplishments to be found on his resume beg the question of why he would publish such a clearly false claim about the number of deaths to be considered. I don’t know the answer. As for Andrew. It’s odd. He’s someone who I think is a sentimental naif a lot of the time. He is obviously smart, obviously enormously prolific in his reading and his writing, and he has fought the good fight over these last several years on a bunch of issue. He certainly has noted the increasing weight of evidence that the Iraq war was a fiasco, and a bloody one at that. At the same time he does seem to freeze every time he faces a claim that has numbers in it. This number, the total of Iraqi dead, is hardly a hidden datum at this point; he should have remembered the controvesies and responses to a number of claims. And yet he gave the props of his influential blog to Posner’s nonesense. Again, I don’t know why Sullivan refused to think for a moment about Posner’s claim before posting. It may be a residual reflex to find some way to defend his initial support for the war: kind of a “hey, it bankrupted this country; devastated that one; brought America into moral jeopardy (see torture, inter alia) and diminished our soft and hard power throughout the world, but at least it saved some kids” thought. Except it didn’t, and there is still no excuse for the moral and strategic error commited in 2003 and compounded since. 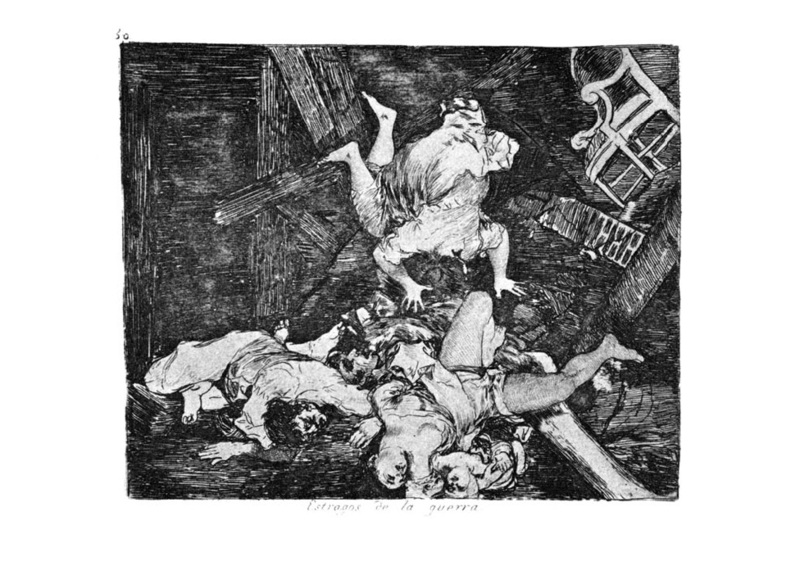 Image: Francisco de Goya, Los Desatres de la Guerra, plate 30, during and after 1810.